You will probably need surgery to put the broken bone back into the right place and hold it there until it heals. Occasionally older people with less complex stable breaks (the bones don't move around) don't have surgery, but the broken bones are held in place in a cast while they heal. 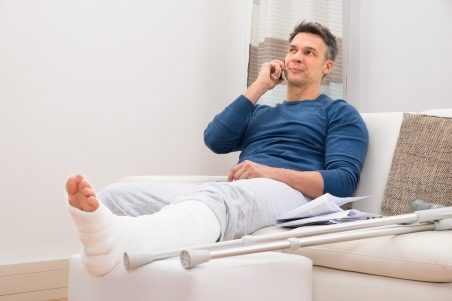 There are several things you can do to help your broken lower leg bone heal, whether or not you are having surgery. Don't do any heavy lifting using your leg, as this will increase your pain and slow your recovery. You will probably need some time off work to let your leg recover. Take regular pain relief. The best pain relief is paracetamol (Panadol) or paracetamol and codeine (Panadeine). Take two tablets every four hours but take no more than eight tablets a day. Avoid anti-inflammatories, like ibuprofen, as they may slow down how quickly your bones heal. The more swollen your leg is, the more painful it will be. To reduce swelling, keep it raised (elevated) above the level of your heart whenever possible. Until the bone is fully healed, be very careful not to twist on it. Twisting can make the bone rotate and heal incorrectly. It's very important to tell your nurse or doctor if your pain is getting worse despite taking pain relief. Increasing pain may be a sign that the swelling in your leg is pressing on nerves and blood vessels, which can cause permanent damage if it's not treated. If you need surgery, it will be done by an orthopaedic (bone) surgeon. Exactly what surgery you have will depend on what type of break you have. Your surgeon will talk to you about exactly what it involves, the risks, benefits, and how you are likely to recover. Your surgery will involve some metal (usually a rod called an intramedullary nail with locking screws, or a plate and screws) to line up your bones properly and support them while they heal. It's possible the screws will be held together with clamps and rods outside your skin to stabilise the break. This is called external fixation, but it is usually a temporary measure until the swelling has gone down enough for surgery. You will probably spend two to three nights in hospital. Your leg will be in a cast or backslab, which is a half-cast that wraps around the back of your leg, for up to six weeks. After that, the cast will either be removed, or changed to a shorter cast or a brace so you can start gently moving your leg. Depending on how unstable your break is you may need to keep all weight off your leg and use crutches or a walker when you start walking again. It's very important to follow your doctor's instructions, as putting any weight on your leg can mean you don't recover well. You may even need another operation to fix problems caused by putting weight on your leg too soon. You will still have to take care of your leg once the cast comes off. You most likely will need at least two weeks off work after surgery. Exactly how much time you will need off depends on how bad the break is, what your job involves, and whether there are any light duties you can do. As you recover, you'll have regular appointments with your surgeon, and some X-rays to make sure your leg is healing well. You may also need some physiotherapy to strengthen your leg and get it moving again. If you have external fixation, this will need to be removed once you have healed. If the metal inside you is causing pain or other problems it will also need to be removed. Exactly when that happens depends on how bad your break was, and how quickly your bones heal. Your surgeon will talk to you about this at the time. At first your whole leg will be put into a cast (called a long leg cast) to hold the bones in the right place and stop them from moving while they are healing. This cast usually starts at the base of your toes and goes up to the top of your thigh with your knee slightly bent. 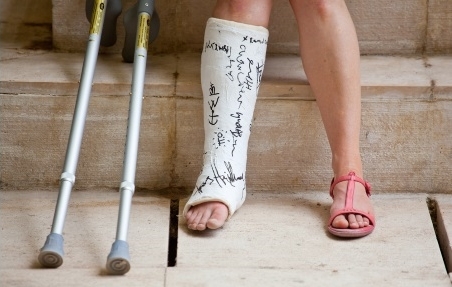 You will have this cast for at least six weeks before it is either removed or changed to a shorter cast or brace that lets you start to move your leg gently. When you start walking again you will need to keep all weight off your leg and use crutches or a walker. It's very important to follow your doctor's instructions, as putting any weight on your leg can mean you don't recover well. You may even need another operation to fix problems caused by putting weight on your leg too soon. You will still have to take care of your leg once the cast comes off. Sometimes a break seems to be stable and is put in a cast, but as the swelling goes down the broken bones move apart and need surgery to put them back in place. For this reason, you will have regular X-rays while your leg is in a cast, to make sure the bones stay in the right place while they are healing. Before you leave hospital, a physiotherapist and occupational therapist will work out what help you might need at home and arrange it for you. You can also talk to a social worker about any worries you have about going home. If you're older than 65, Older Person's Health Specialist Services will review your health with the orthopaedic team. When you leave hospital you will be given a follow-up appointment, a discharge letter and a prescription or medication card if you need one.